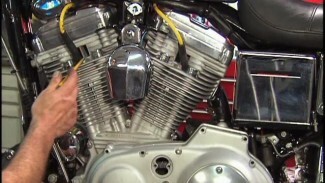 Harley starter removal is quick and easy on 6 speed model Harley Davidsons. On 5 speed models, the outer primary cover needs to be removed in order to release the Harley starter shaft and bendix gear. This means, not only more time but also, an outer primary gasket, derby gasket, starter bolt lock washer, and primary oil. 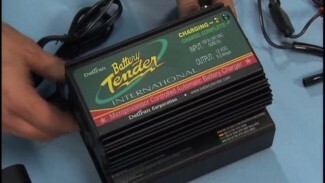 Here, Mike demonstrates starter removal on a Touring model. Always start by disconnecting the battery. 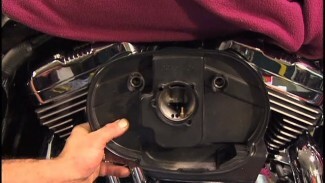 Use a 12mm wrench to remove the positive cable from the top of the Harley starter and use a 1/4″ ball allen with an extension to remove the starter mounting hardware. If there are any obstructions, like the neutral switch wires, O2 sensor wires, or transmission vent hose, simply disconnect and move them aside temporarily. After removing the Harley starter, there will also be access to the speed sensor, below. Before reinstallation of the starter, be sure to replace the sealing o-ring and clean its sealing surface. Use the dowels on the back of the inner primary case for proper alignment. If your starter is grinding, remember; replacing the starter or starter bendix may not be the only area to address. The Harley starter gear engages with another gear; the starter ring rear, which is pressed onto the back of the clutch basket. It is always important that these gears are replaced together. Also, a bad compensator assembly may be the reason for the damaged Harley starter bendix & ring gears. In many cases, replacement of these gears may only be a temporary solution. If it is determined that the compensator assembly is out of spec, we suggest upgrading to the Baker compensator assembly. With the Baker assembly, new starter gears, and a healthy, fully charged battery, you will have thousands of successful starts without issue. See our videos on the Baker compensator overview and upgrade.